Twitter is a little like facebook since you friend, or follow, people and then watch what they say and do. You can also message and shout on to friends on both. Unlike fb, Twitter limits your messages to 140 characters. People generally either think Twitter is totally lame, the end of the social world as we know it or the best social media/news room tool that ever saved print media. Here’s a screencast that will charm the pants off you as well as explain it better than I can. Bloggers on the tech side usually like it and use it to share ideas, ask for feedback, make jokes and publish RSS feeds of their blogs. So, in getting the Inside Islam site launched I began to twitter too. Sometimes I hate it. Like when I follow someone and they don’t follow me back. I end up asking them questions without being answered because they can’t see my updates. I won’t get into it. The whole thing makes you feel stupid for even creating any account. Other days, like when Sarah Palin wins the worst interview in the universe contest, I love it. Here’s a tweetscan of all the posts that mentioned “Bush Doctrine” today. It’s kind of cool in a “hey, even this marginally important social network has a vast user reach” sort of way. It’s unexpected. Huffington Post wrote a blog entry about the Palin Interview craze on Twitter. 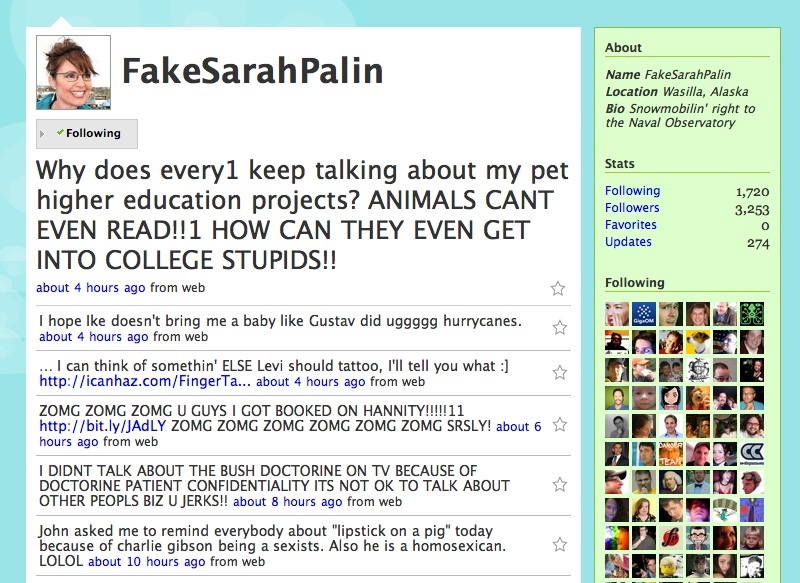 There’s even a FakeSarahPalin username now.